The temptation is great in this day and age to open a bio template and adapt it to whatever the current bio request may be. After all, most of us have numerous copies of vita-type info sitting around on hard drives, and it’s easy to just drop one in and adapt it. The Digital Storytelling course seems to me, in part, to be about rethinking how we communicate in the current technological reality, and so I wanted to not yield to that temptation. Nevertheless, I find myself cowed in the shadow of the sheer amount of creativity shown by classmates whose blogs I have barely skimmed for lack of time. I snuck a peak at the entry for one of my friends and colleagues who is also in the course. Anyone who knows her will not be surprised that I am continually impressed with both her technological and communication abilities, and that entry just confirms it. She threw that together in an hour? That would have been at least a weekend’s project for me, and it would not looked nearly so good. So I’m focusing on text (as you can tell from my WordPress theme). And that sort of is my introduction, in a way. I’m a techy-feely sort of person as well, but in a different way. Words have always been my preferred medium, and just about everything I have ever done ties back to that. I started with computers in order to have control over my own tools for writing. I started out as a writer, worked for years in newspapers and small magazines, and that’s still where my head and heart mostly live. I teach speech and have a passion for that. I use video when I can make a point for students better that way, and I stress to them that a speech isn’t simply a paper out loud, that the paralanguage and nonverbal communication aspects of speech make it something way beyond words alone. But the written and spoken word has always been my main focus–at least until recent years. 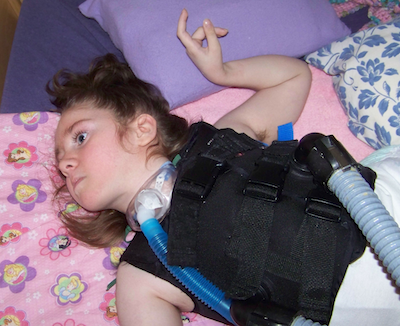 I have a severely disabled daughter, nearly 8 years old. For the first 4 or 5 years of her life, we took care of her at home 24 hours a day. My middle son (the oldest kid still at home) and I split the work. He put his education on hold and took care of her during the day while I worked, and then I took care of her at night, sleeping as I could (and without going into too much detail, he often took care of her all night too when I collapsed from exhaustion). I pretty much quit writing during that time, except for blog postings, and then those tapered off too. We’ve been very fortunate the last three years to have 24/7 nursing at home. I have finally caught up on my sleep. I thought I would start writing again, but found that the well was dry. I’ve just had nothing to say. I thought that perhaps that part of my life was over, but lately I’ve been feeling that, perhaps, the well is starting to moisten again. Perhaps the water is seeping back in. That’s where the Digital Storytelling course comes in. It may or may not get me fully back in the writing saddle, but I think it should help me figure out whether my horse is still around or not. Wow, what a moving introduction. I hope that this class affords you the opportunity to re-find your voice.